The Rolling Pin quilt block is an easy nine patch and introduces the quilter to the flying geese patch and the square in a square unit. This block is a good choice for learning how to use half square triangles in a patch differently than making a single square using the two triangles, as is the most common practice. 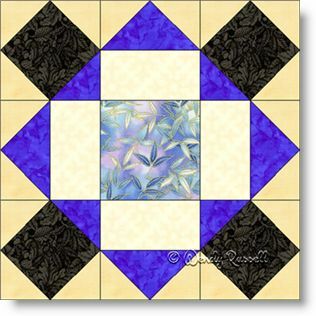 The sample quilts illustrated give you suggestions for using just the block, set side-by-side or adding additional plain blocks to feature your quilting skills.